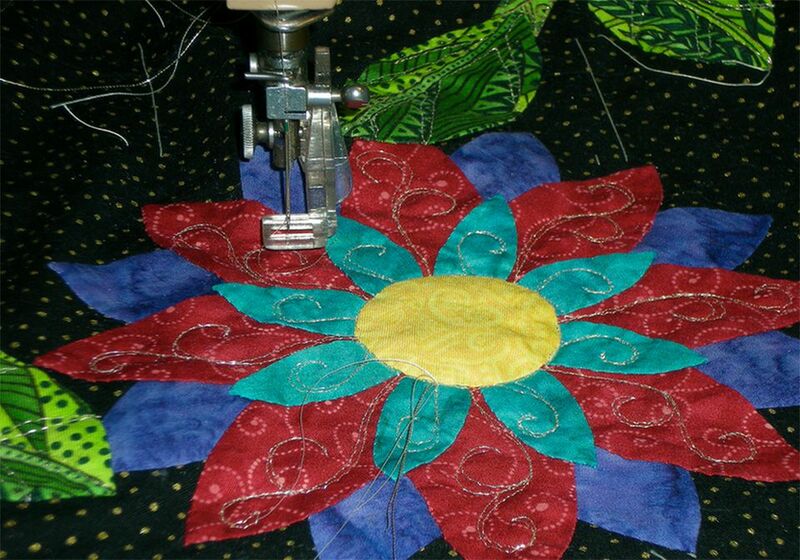 A growing number of quilters use machine quilting as their primary quilting method. Quilters can choose from many options, from intricate designs to straight machine quilting stitches. The good news is that you do not need a special sewing machine. There are two basic types of machine quilting that can easily be accomplished on most sewing machines—straight line and free motion. Straight line quilting is the easier of the two techniques but both require a bit of practice. Straight line machine quilting is best accomplished by replacing a regular presser foot with a walking foot, often called an even-feed foot. A walking foot is a specialized pressure foot that grips the top of the quilt sandwich, advancing it through the machine at the same rate as the quilt's back, which touches and is moved along by the sewing machine's feed dogs. Moving the quilt evenly through the machine keeps the layers of a quilt sandwich from shifting apart as the quilt is sewn, which reduces the distortion and the pleats that can occur if one layer of the quilt sandwich is out of sync with the other layers. Gentle curves are possible with a walking foot, but intricate patterns require free motion machine quilting techniques. Compare prices of walking feet on Amazon.com. The machine's feed dogs are lowered when you use free motion machine quilting techniques, so nothing is in place under the quilt sandwich to guide it along. The quilter is in total control of the motion. The speed of your movements and how fast you run the sewing machine both work together to determine stitch length. The foot you use can be either a darning foot or a special foot made for machine quilting. Special feet resemble a darning foot but have much larger openings. Compare prices of free motion feet on Amazon.com. The demand for sewing machines that make it easier to machine quilt has increased in recent years, so manufacturers have introduced new models to satisfy our sewing wants and needs. Bernina's Stitch Regulator is one feature that helps even beginning machine quilters sew evenly spaced free motion stitches. Other sewing machine manufacturers have developed special presser feet to help quilters use their machines more easily, too. Do keep in mind that, while high-end machines are fantastic, you can machine quilt with just about any sewing machine. Generic walking feet and are available for most sewing machines, and so are their free motion counterparts. Today's quilters have more resources than quilters of past generations. Rotary cutting techniques, an endless selection of fabrics made with dyes that don't bleed or change color, threads to suit every need, plus sewing machines loaded with time-saving and creativity-enhancing capabilities. Stencils and other types of guides are available to help you sew machine quilted projects—even free motion quilting stitches needn't be random. Start by machine quilting a small project, maybe a table runner, a mug rug, or a baby quilt, just to get a feel for the technique. If machine quilting turns out to be a technique you love, research machines to discover which one might be the best choice for your needs. This article contains e-commerce links, and we may receive compensation in connection with your purchase of products via links on this page. How Does a Sewing Machine Throat Plate Help You Sew?